The new law bans covered stores throughout Ulster County from providing single-use plastic carryout bags and requires them to charge $0.05 for each recyclable paper bag provided to customers. The law is set to take effect on July 15th, 2019. Based on input provided by County Executive Hein, the bill’s supporters have agreed and have assembled the necessary support to amend the law prior to its effective date to include: a provision that would exempt SNAP (Food Stamps) and WIC recipients from paying the $0.05 fee for recyclable paper bags, and a six-month educational campaign that will begin prior to full enforcement of the law. Full enforcement, including potential fines for violations, is anticipated to begin no later than January 1, 2020. 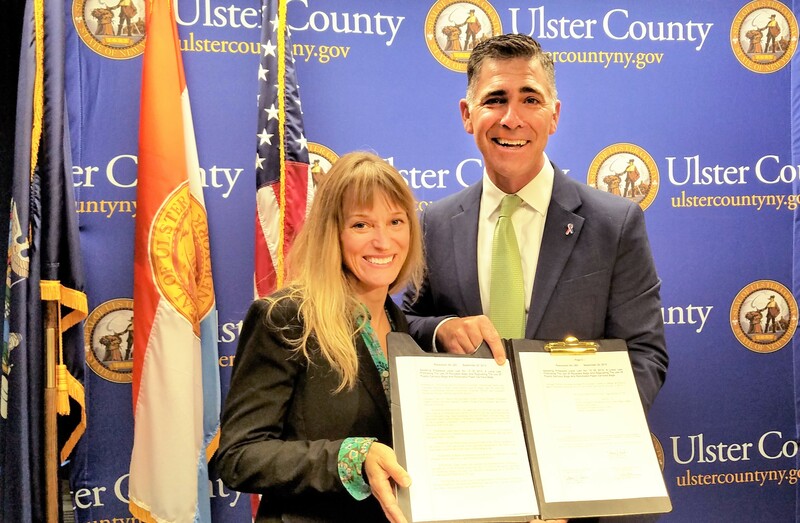 With this action, Ulster County becomes the thirteenth municipality – and the only County – in New York State to adopt local legislation banning single-use plastic bags as a means of reducing the environmental impacts associated with plastic waste. County Executive Hein and the bill’s sponsors anticipate the bill will provide a model for other communities throughout New York State and further amplify local pressure on statewide elected officials to implement a statewide “bring your own bag” law. Under provisions negotiated by County Executive Hein and agreed to by a majority of the bill’s original sponsors, the Legislature will adopt amendments to the bill at a future legislative session. Those amendments provide for an exemption of the $0.05 fee for recyclable paper bags for recipients of SNAP (food stamps) and WIC and outline a six-month period during which enforcement of the new law will be delayed as the County performs outreach and education to members of the public and covered stores regarding the law’s provisions. Following this education campaign, the law will go into full effect by January 1, 2020. The bill passed in Ulster County differs from less effective measures implemented in other areas, which either impose a fee but do not ban plastic bags, or simply require plastic bags to be accepted for recycling. Ulster County’s new law involves a full ban on single-use plastic bags at all covered stores, coupled with a required fee for recyclable paper bags, which is charged to the customer and recorded on their receipt. The hybrid ban-and-charge model is designed to encourage shoppers to bring their own reusable bags. Other locations that have implemented similar hybrid ban-and-charge laws have seen dramatic reductions in plastic bag waste. In addition to reducing plastic pollution and mitigating the harmful impacts it has on the environment and on human health, the bill’s provisions are expected to head off future costs related to plastic production, distribution and disposal as the volume of single-use plastics reaches a tipping point. According to the New York State Department of Environmental Conservation, American retailers spend $4 billion annually to provide single-use plastic bags – a cost that is invariably reflected in the prices that consumers pay at the checkout. Additionally, plastic waste is increasingly responsible for expensive failures of sewage and water treatment plants as well as recycling facilities, where plastic film can interfere with sensitive machinery. Collection, hauling and disposal of plastic waste is a growing challenge that threatens to cause increasing costs for municipalities and private companies alike. By promoting reusable plastic bags, laws like Ulster County’s are designed not only to protect the environment and human health, but also to reduce inefficiency and waste that ends up costing consumers money. Photo: Ulster County Legislator Tracey Bartels (left) and Ulster County Executive Mike Hein (right) hold a signed copy of the bill known as The Bring Your Own Bag Act.